While milk may be a good source of calcium and protein for vegetarians, many people are going vegan and dairy-free or reducing their consumption of dairy due to food allergies, in an effort to reduce fat and cholesterol intake, or just to take advantage of the many health benefits of soy. Need a vegan dairy substitute for baking, cooking or drinking? Soy milk, almond milk, and rice milk can all be easily substituted for dairy in most recipes. The good news is, soy milk is healthy, cheap, and easy to find and use. The bad news is...well, there really is no bad news! From a nutritional perspective, soy milk has almost as much protein as dairy milk, less fat, no cholesterol, and, since most soy milk is fortified, is a comparable source of calcium. Vegans should make sure to find a brand that is fortified with Vitamin B12. Soy milk is an excellent dairy substitute for vegan baking or for kids. Each brand of soy milk is slightly different, so try a couple and see which one suits your taste buds best. Soy milk is increasingly popular, and many grocery chains, such as Trader Joes, Whole Foods and Safeway make their own brand in a variety of flavors. We recommend trying Silk brand unflavored soy milk to start, though the chocolate flavor is an incredibly tasty treat. Rice milk is not as thick as soy or dairy milk and has a somewhat translucent consistency. Because it is slightly sweet, rice milk works well as a vegan milk substitute in dessert recipes, but it is less suited for savory or salty dishes, such as vegan mashed potatoes. Compared to soy and almond milk, rice milk has less protein. We like using rice milk as a vegan milk substitute in my morning cereal. Hemp milk is less common than soy milk, which you can find just about anywhere. Look for it in aseptic (non-refrigerated) packages in a well-stocked grocery store, sometimes near the cereal and other breakfast foods. Can't find hemp milk at the grocery store and want to try your hand at making your own? Here's a vegan hemp milk recipe to try, made from hemp seeds, water, and a little sweetener. 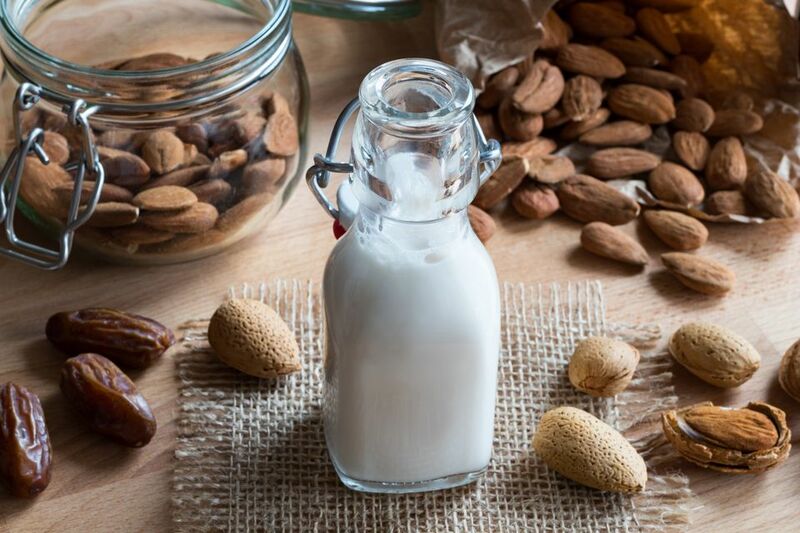 Vegan milk substitutes made from almonds or other nuts, such as cashew milk have a creamy consistency similar to a thick soy milk and a nutty taste perfect for making vegan fruit smoothies or other creamy drinks and desserts, though they don't taste much like dairy milk, and are best in non-savory dishes. Be sure to shake your almond milk well before using. If you can't find almond milk at your grocery store, try making homemade almond milk or cashew milk. Substitute soymilk, rice milk or almond milk for milk in most recipes. You won't even be able to tell the difference in most recipes, including breads, muffins, cakes, vegan cookies, puddings, and other creamy desserts. Any milk substitute will work fine, so it's really a matter of personal taste. We find that rice milk is a bit too sweet for me on cereal, but you may find that the sweetness of the rice milk just enhances the taste of a bowl of cereal. For extra flavor, try using vanilla flavored soy milk on your cereal- yum! Regular or unsweetened soymilk will work best in recipes such as pasta sauces, cream sauces, mashed potatoes, salad dressings and other savory recipes that call for milk. Although a thick soy cream is best for creamy recipes such as non-dairy alfredo sauce, a reasonable facsimile can be made with a basic vegan roux. You can find thicker soy cream at well-stocked natural foods stores. If a recipe calls for buttermilk, add one tablespoon of white vinegar or lemon juice to a cup of soymilk to replace buttermilk and mix well. It's not quite as robust as buttermilk but will have a similar flavor.